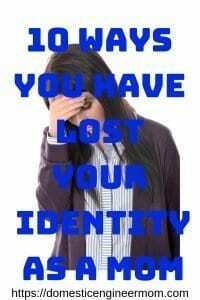 I hear you, I had an identity crisis for so long that I didn’t even recognize myself anymore. 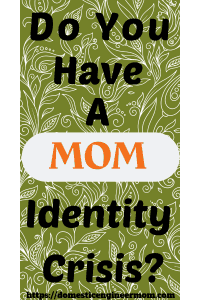 I know I’m not talking to every mom on earth here, but if you are reading this, then you also will be able to relate to having an identity crisis. You know you have an identity crisis as a mom when you look back and say “I sure do miss doing that.” When you have let go of everything you used to enjoy. Or enjoying the way things used to be. Believe me, you can still enjoy the things you used to enjoy, it will just look a little different. We will get to that topic later on. When people ask you “What do you do?” Yes, that happened to me about 3 years ago by someone I had gone to school with all my life. I hadn’t seen them since high school. I think this is a pretty typical thing to ask someone you know that you haven’t seen in a while. This is where I came to a crossroad with my thoughts and my life. Am I just a wife, and a mom of 4 that homeschools? Is this what my life has been condensed to? I’m glad you are here, and hopefully, I will enlighten you on “How I Rebounded” from what I learned about having a Mom Identity Crisis. Honestly, this has been a very hard subject to write on. The thought of me exposing my most inner thoughts of how I’ve put my life on hold for my family does not come easy. But I feel it’s necessary for me to tell my story. By exposing what I’ve gone through, I will hopefully inspire someone else to take a look at their own lives and help uncover who you are supposed to be. We really need to be more open as women and as moms. There is no shame to say you are struggling if anything it makes you a woman of courage to admit it. Becoming a mom is life changing. One of the highest peaks in your life. It changes your whole perception. You are now responsible for this tiny little human being and their needs will come first. When you have more than one, that will put even more emphasis on your children’s needs and you become lower on that totem pole. And if you are married or have a significant other, then there you go further on down the chain. I have been a mom for more than half my life and would never change a thing. I actually became a mom before I became a wife. I know it’s not a traditional way of doing things. Sometimes life throws you a curve ball and it is what it is. That’s another thing I wouldn’t have any other way. This is where my story begins. So I want to share with you a brief explanation of how I came to this juncture in my life. I shared with you that I became a mom before I became someone’s wife. Overall having my first child didn’t change a whole lot of things in my life. I mean I did have to become more responsible, find a steady job with benefits and put her needs first. I would say I was still a fun person to hang out with. I enjoyed going out with friends. Going and listening to bands play and when my friends had get-togethers, I took my daughter along with me most times, she was still a baby. My friends were very supportive of my daughter is around. She was a part of me. I also had a very supportive family that helped me with her. Things actually really didn’t change until I got married. My daughter was 2 1/2 at the time. I wanted to devote my time to my husband and build a family with him. I became pregnant within the first few months after being married and within a year we became 4. I can look back now and see where that’s when I started losing my identity. Life happens with all the ups and downs. Typically that would be accurate for the most of us. I didn’t know how to separate Robbin, the person that liked music, and liked playing it more than watching tv. I liked to get in the car and go for drives, I think I got that from my mom because she liked to do that. I loved playing cards, rummy to be exact. I liked to go walking. I really liked to be social and go out. I loved getting dressed up, putting make-up on and doing my hair. Loved dancing around my house, even though I’m not a really good dancer. I used to dance with my daughter on my hip, of course alone. Good lordy nobody wanted to see that, or at least that’s what I thought. I’m not really sure where I got it in my head that it wasn’t ok, that I couldn’t be that person anymore. What made me think that I couldn’t do the things that brought me happiness. Don’t get me wrong I love my husband and kids and they do bring me happiness. But somehow I lost that zest that made me who I am as a person. I had a hard time joining the 2 together. Being me as a person and also being a wife and mother. Fast forward a few years and we were blessed with 2 more children. Both were born with special medical needs and that in itself can overtake your life and you can easily loose who you are as a person. So for me, it was a double whammy! Now I became this person that lived in survival mode every day. I truly just stop looking in the mirror or even listened or acknowledged my own feelings. I just became a mom blob. Just going with the emotions of day to day life. Believe me, you can’t live in survival mode 24/7. It’s not healthy for you or your family. I have another post on Mommy Burnout if you would like to read it. Just click here when you are finished reading this post. 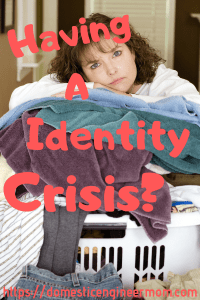 So here is where we get down to the nitty-gritty of what can cause you to have a Mom Identity Crisis. I’m sure there are 20 million reasons why you have found yourself in this place. Well, that might be overshooting the number a bit, but anyway it might feel that way sometimes. I want to list a few reasons here I’ve experienced, and that had led to my own identity crisis. Also, I want to include what I’ve learned from other mothers that have been in this position also. I know that this may sound offensive to some (that was me probably 5 years ago) but your children came into your life, not the other way around. 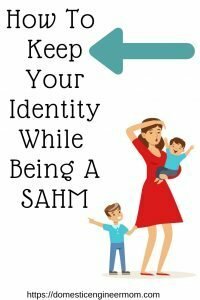 Being a SAHM can make you easily feel isolated. Get out of your house, go for a walk, join a mommy group. You need to socialize! As I said before this is just a few. But I wanted to add something else before we get to some easy to follow steps to pull you out of your mom identity crisis. I am a huge advocate of self-care now. I’m not perfect, I still have to remind myself quite often. Understanding how important it is for moms to take care of themselves will carry you much further. So when those hard days come you are better prepared to take them on. Slay The Day! First and foremost whoever you were before, that is before you became a mom, YOU are still YOU! It just looks a little different, you just have to learn how to tweak your new life as a mom to incorporate what you did before you had kids. I know sometimes we need to put our family first. I can say that I totally understand because I have 2 special needs children and they do require more of my time. But don’t forget you have needs too. There will be seasons but make sure those seasons don’t turn into years. When it comes for self-care it doesn’t have to be complicated. Take one thing you enjoy doing and do it. Read for 30 min, put a face mask on, paint your nails, take a shower. You see where I’m going with this. Don’t over complicate it. If you continue to not take care of yourself, there will be consequences. I’ve been in those shoes and some things are irreversible. If you had a hobby before continue doing it or pick up a new one. As I said earlier, get out of the house and meet up with another momma or just walk around your neighborhood. If you are married or have a significant partner, let them how you feel. They can’t help if they don’t know. I’m a huge guilty person in this area. I feel I need to do everything and don’t delegate very well. You need time together with your partner. You need to be able to connect on an emotional and sexual level. You need adult time! Stop feeling guilty for wanting time alone or wanting something for yourself. If everyone is taking from you all the time you will end up with nothing to give. You will become an empty vessel. 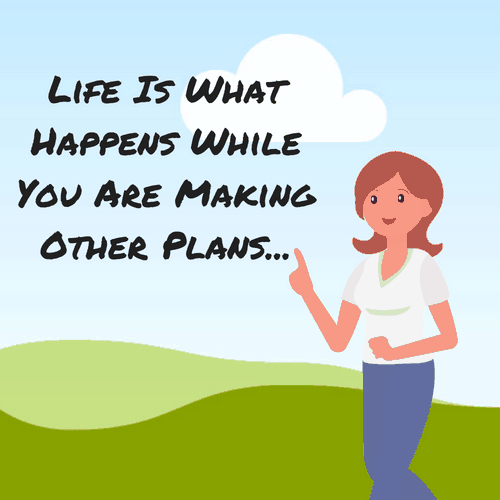 Live a life with no regrets! You don’t want to wait till the end of your life and say(” I wish I would have _.”) Don’t spend your whole life being of service to everyone else and not live the life you deserve. You can be there for your family and be the woman you were born to be! I want to thank you for taking this time to read this post. It is very personal to me because this is an area I struggle in.